Our comprehensive competitive analysis goes beyond the usual comparison of the features of a product or service. Our competitive analysis Excel template identifies competitive factors at three levels. The first level is a straight PRODUCT to PRODUCT comparison, e.g. a particular iPhone model compared to the nearest equivalent from Samsung, e.g. price, features, etc. The second level compares the enterprise’s relative strengths in addressing the overall MARKET, e.g. brand, product range, market share, market coverage/distribution network, customer service, etc. The third level compares at a CORPORATE level in terms of factors such as financial resources, R&D innovation capability, global presence, technology, management, etc. We offer two different templates. Our standard Competitor Competitive Analysis Excel template is suitable if you only require comparison and analysis on the product level. This Comprehensive Competitive Excel model provides a framework/matrix to analyse up to five competitors at each of the three levels. This Comprehensive Competitive Analysis Excel model allows you to rate each of the chosen competitors for the competitive factors that you deem most important. You can use up to 7 Competitive factors for the analysis at each of the three levels, i.e. 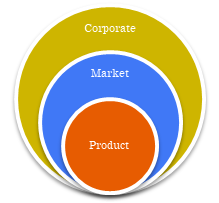 Product, Market and Corporate. You choose the factors that you deem most important for your market and your analysis. A weighting can be given to each competitive factor, e.g. Price might account for 35%, product features for 20%, etc. The weighting factors reflect the relative importance of the different competitive factors. The relative importance of each of the three levels is also taken into account in calculating the weighting factor to be applied to each competitive factor..
(2) a second based on the adjusted competitive scores reflecting the weighting factors assigned to each factor. Bar and Radar Charts (see images above, click to enlarge), for each of the three levels and overall competitive position, are automatically generated based on the scores given to each competitor. A Total Competitiveness Score is also calculated for each competitor and a corresponding Bar Chart and total competitive profile is produced. Check out our standard Competitor Competitive Analysis Excel template, that does comparison at the product level, if you need something less comprehensive. If neither is exactly what you need, please contact us and we will see if we can meet your needs. Check out the Comprehensive Competitive Analysis Template User Guide for full details and features prior to purchase! All products come with a 10-day no quibble money back guarantee!